Yosemite is known for its waterfalls, but I gotta say, I think I’m happiest photographing Yosemite when the falls are dry. Not that I don’t love Yosemite’s waterfalls (I do! ), but when the falls are dry, the Merced River has slowed to a reflective crawl that paints reflections everywhere. And as an added bonus, when the falls dry up, so do the crowds. Last month I spent a day guiding a couple from Sweden through Yosemite when the Merced River was at its drought-starved nadir. I’d been looking forward to this day for a while, but two days earlier I’d cracked ribs and my collarbone in a cycling accident—I could walk, I could talk, but I couldn’t do both, and simply getting in and out of the car was an achievement. The seatbelt? Torture. So my camera and tripod stayed in the car all day. But when we pulled up to Valley View for sunset, I just couldn’t resist the mix of light, clouds, sky, and reflection. By the time I extracted my camera and tripod and made my way down to the river (no more than 20 feet from the car), the sun was about done with El Capitan. There were a few hot spots in the clouds, but my Singh-Ray two-stop hard GND held back the highlights enough to enable enough exposure to bring out the shadows. The resulting 25 second exposure added a gauzy texture to the reflection. The trickiest thing about photographing a reflection with embedded features is achieving depth of field throughout. Though it seems counter-intuitive, the focus point for a reflection is the focus point of the reflective subject, not the reflective surface. In this case I wasn’t too worried about the reflection because I knew the long exposure would soften it anyway. But I did want to be sharp from embedded rocks all the way back to El Capitan. A quick check of my hyperfocal app told me that at f11 and 28mm, focusing on the closest rock (about ten feet away), would ensure sharpness all the way to infinity. I don’t always wear a helmet when I bike. I’m fortunate to live adjacent to a bike trail that can keep me off city streets for virtually all of my bike trips, so (my rationalization went), why mess with a helmet? My accident last month happened on the bike trail, with no cars in sight, when I clipped a portable barricade with my handlebar and my bike went right while I continued forward. In addition to cracked ribs and collarbone, some nasty road-rash, and a torn-up shirt, my helmet was totaled. I shudder to think what would have happened had I decided not to wear a helmet that day (about a 50/50 chance), and will never, ever ride a bike again without one. I encourage you to make the same promise to yourself. I return you now to your regular programming. Absolutely beautiful work. Thanks for braving the pain from your accident to capture this wonderful beauty. Oh,.. and I strongly second your public service announcement. Thank you, Rich. It’s sobering to realize how quickly life can go from normal to crisis. Gary- Examples of your usual spectacular work, but please tell me you haven’t crossed over to the dark side of HDR !!!! A stunning selection! Glad to hear you were wearing a helmet, I always do, and so far I’ve been fortunate to never have had occasion to need it. 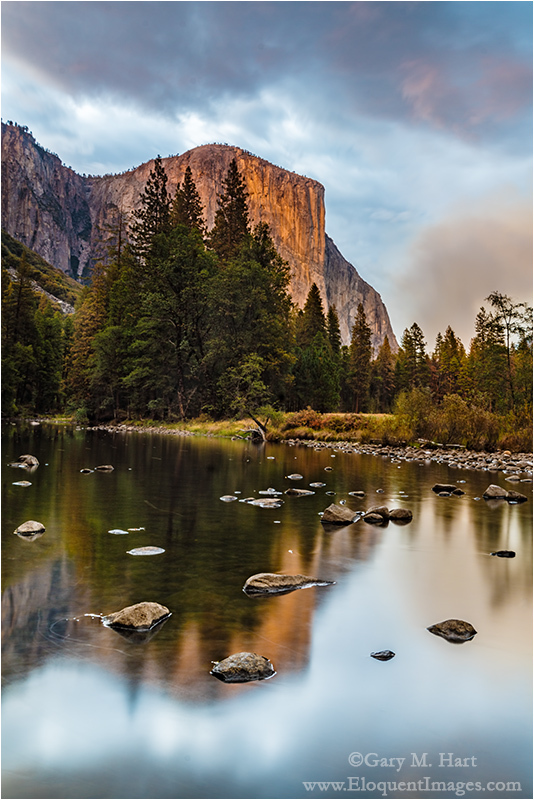 Beautiful photos of Yosemite, Gary! I learned something new after viewing your photos: you can shoot a photo of JUST the reflection and not both the main subject and its reflection. I’m fairly new to photography, just a hobby for me, but I never ever thought of shooting only the reflection. Guess I’ll have to take a Yosemite workshop someday and try it out! Thanks for the new insight! My pleasure, Bernie. Thanks for reading.